Deondre Francois still isn’t a household name across America despite a stellar freshman season in Tallahassee. That’s about to change on Saturday night when Francois plays in the biggest game of his life against No. 1 Alabama in Atlanta. If you saw Florida State’s offensive line play last year, you understand the concern. Alabama enters the “Greatest Opener of All Time” with another stacked defense that’s headlined by massive defensive tackle Da’Ron Payne. And the Tide’s defensive line will be teeing off against an FSU offensive line that was much-maligned last fall; Francois was sacked 34 times in 2016 and took more big hits than a quarterback should take in an entire college career. 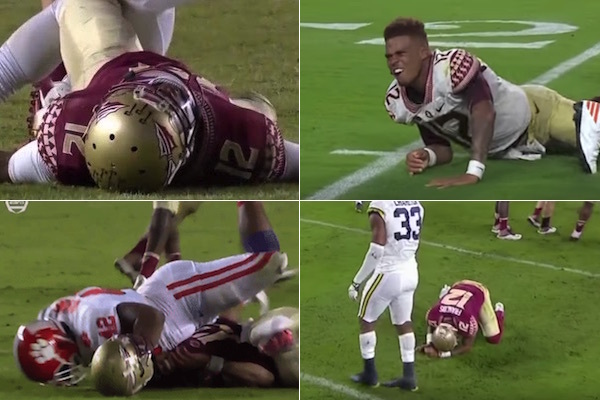 But the 6-foot-2, 205-pound Francois just kept getting up after each brutal hit to throw for 3,350 yards and 20 touchdowns. Thanks to Francois’ perseverance, Florida State finished with a 10-3 record and an Orange Bowl victory over Michigan. According to his mother, Janice, Francois’ fortitude is nothing new. Francois’ grit has also impressed his coaches and teammates. As for Francois, he doesn’t point fingers at his offensive line or bemoan the punishment he took as a freshman. In fact, it’s quite the opposite. “It’s a part of the game, and I feel like if you can’t take hits, you shouldn’t play the game,” Francois told the Orlando Sentinel. This season will require Francois shortening his internal clock to get rid of the ball quicker and drastically improved play by the O-line. There is reason for optimism, as Francois now has a year of experience under his belt and four of five starters in the trenches return from last season. But there is also reason for concern. The lone departing starter was arguably the ACC’s best lineman, Roderick Johnson. And the unit’s top two backups, Jauan Williams and Baveon Johnson, recently sustained season-ending injuries — making the line’s depth very thin. We’ll find out just how much Francois’ internal clock and FSU’s line have improved real quick, as Lindy’s rates Alabama’s defensive line as the third best in college football. If Francois isn’t protected better, he’ll never make it through another season uninjured. But if he is, the No. 3 Seminoles just might find themselves back in Mercedes-Benz Stadium come January for the College Football Playoff National Championship. Jim Weber is the founder of College Sports Only. He has worked at CBS Sports, NBC Sports and ESPN the Magazine and is the founder of a previous college sports website, Lost Lettermen (R.I.P. ).